Thank you Lord for the gift of art and the gift to receive your message through it. I grew up as the 5th of seven children. My family was always into something related to art and I was no exception. In 1959 I married and immigrated to America where my husband and I raised a family of three children. As the children grew older and moved on, I rediscovered my love for the arts. I studied art in the States, Germany and Malaysia, in pottery, sculpture and painting. My artwork was very poetic. I recognized to let my soul speak not just in paintings but also in poetry. More and more I rekindled my love for writing. In 2004 I self-published my first book: “When your Heart starts to speak” with paintings, poetry and scripture. Then in 2006 my second book also with paintings, poetry and scripture “My Walk”. My poetry touched so many hearts that I decided to publish my next book. My friends encouraged me much to publish through a publisher so more people would have the opportunity to read my book. 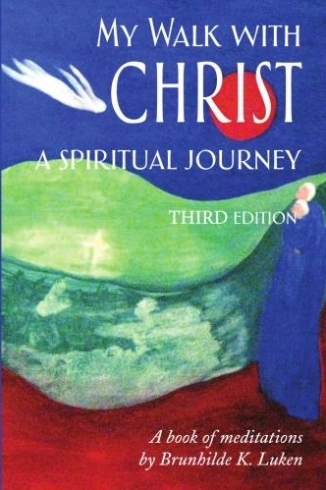 “My Walk with Christ, A Spiritual Journey” is a small book without paintings. In this book I was able to voice the deep gratitude of a life lived before God in trust, a life that knows His love is for the world He has created, sustained, redeemed and will transform into a “new heaven and a new earth.” Our spiritual journeys are channels for transformation. We give away what we have and continue to receive in abundance from God, knowing that finally, it is God’s world for God to shape. My journey is full of God’s felt love, God’s guiding hand, God’s invitation for us to trust Him fully, and receive His gifts of peace and joy. In January 2014 I re-published this book as a second edition and added about forty pages of experiences on my journey with the Lord. This book is available at most bookstores. My paintings are also reaching a deeper level. In my art as in my writing I touch the core of self, where I feel the presence of the Lord, where the world stands still. My paintings always become something different than what I intended it to be. If I don’t touch that core, I consider my painting not finish. I like the viewer to feel the painting. I love to sit and meditate on my own paintings. “True art is made noble and religious by the mind producing it…the endeavor to create something perfect, for God is perfection, and whoever strives after perfection is striving for something divine” (Michaelangelo). “Be guided by feelings alone… Before any site and any object, abandon yourself to your first impression. If you have really been touched, you will convey to others the sincerity of your emotions”. For many years I was a member of the Commission for Women of the Diocese of Worcester, MA and contributed to their blog. All those blog posts are now on this site. Over the years my work has received special recognitions at different art exhibits.